Founded in 1962, Federal Realty Investment Trust is one of the oldest REITs in the world. The company specializes in high-quality, neighborhood shopping centers that are anchored by grocery stores and located in large, highly affluent markets. Today the REIT owns 104 properties, comprising 24 million square feet of leasable area which is under long-term (average remaining term 8.2 years) leases to over 2,800 tenants in numerous sub categories. In recent years, Federal Realty has been investing more into non-retail properties such as offices, hotels, and apartments. Most of these properties are close by or directly connected to its shopping centers. It's no secret that many U.S. retailers are struggling. In fact, 2017 saw the largest number of store closures in history, worse than even the financial crisis of 2008 and 2009. However, despite tales of a "retail apocalypse," traditional retail continues to see steady growth, according to data from Hoya Capital Real Estate. Retail sales have grown thanks to continued economic expansion and strong consumer spending, and Hoya notes that the actual number of net U.S. retail stores still increased by just over 4,000 in 2017. However, as with all highly competitive industries, there will be winners and losers. The key to long-term investing success is to make sure you are buying high-quality industry leaders, with strong competitive advantages that can ensure recurring and growing cash flow that supports a safe and rising dividend. Federal Realty Investment Trust has several such advantages that make it arguably the highest-quality shopping center REIT, and in fact one of the best managed REITs in the entire world. For one thing, there's the very experienced management team. For example, CEO and President Donald Wood started off with the REIT in 1998 as COO and CFO and took over the top spot in 2002. Before joining Federal Realty, Woods served as the chair of the National Association of Real Estate Investment Trusts (NAREIT) and was also a member of the executive Committee of the International Council of Shopping Centers (ICSC). He also has served on the board of Post Properties, an Atlanta-based apartment REIT, and was named “Entrepreneur of the Year in Real Estate” by professional services firm Ernst and Young. It's precisely this kind of experienced and long-term focused management that has made Federal Realty such a success over the past 55 years. Specifically, this is due to the REIT's focus on quality over quantity. 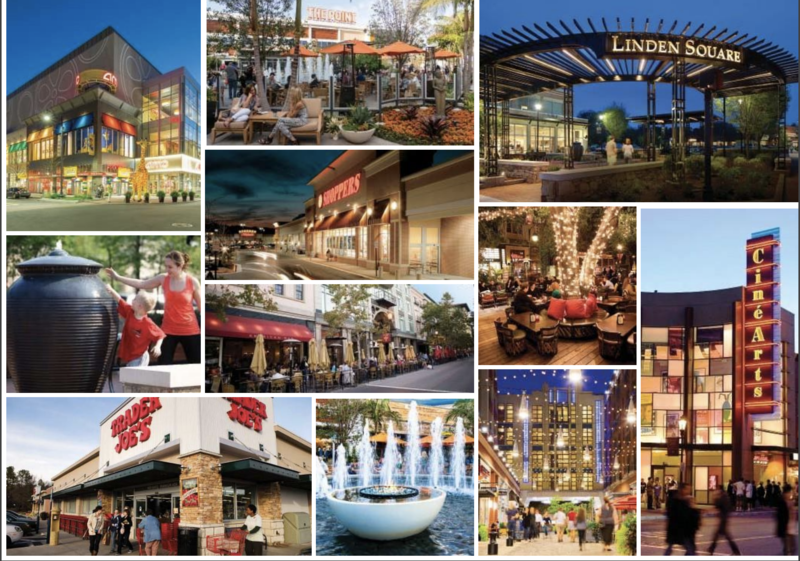 For example, the REIT has focused almost exclusively on owning premium shopping centers, mostly anchored by grocery stores (which ensure strong, consistent foot traffic) in America's most affluent and thriving markets. To ensure that its tenants, who operate under triple net leases (they pay all maintenance, taxes, and insurance costs), do well, the REIT has made sure to focus on acquiring and developing centers in the highest density and wealthiest areas within its core markets. This strong focus on top tier centers, with strong tenants, has allowed the REIT to generate average rent per square foot that's more than 50% higher than its peer group average. Even better, Federal Realty's superior locations mean that not only does it enjoy industry-leading rents, but the company has been able to steadily increase its rental at fast rates. You can see this in the REIT's lease spreads, which measure how much average rent increases when a new lease is signed. This occurs when a tenant either leaves early (due to store closure) or signs a new lease once the old one expires. 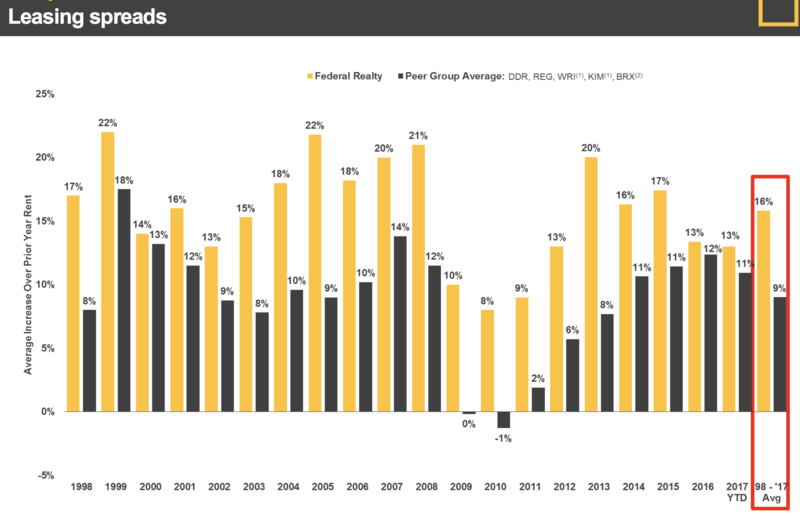 Since 1998, Federal Realty's lease spread has averaged over 15% (peers averaged 8%) and never declined, even during the financial crisis when its peers recorded negative spreads. Federal Realty continues enjoying double-digit lease spreads today as well. In other words, its tenants appear to be doing well to be able to afford much higher rents. Thanks to its strong pricing power, Federal Realty has historically achieved industry-leading growth in funds from operations, or FFO, as well. That in turn has allowed it to generate the industry's safest and fastest-growing dividend over the past decade. 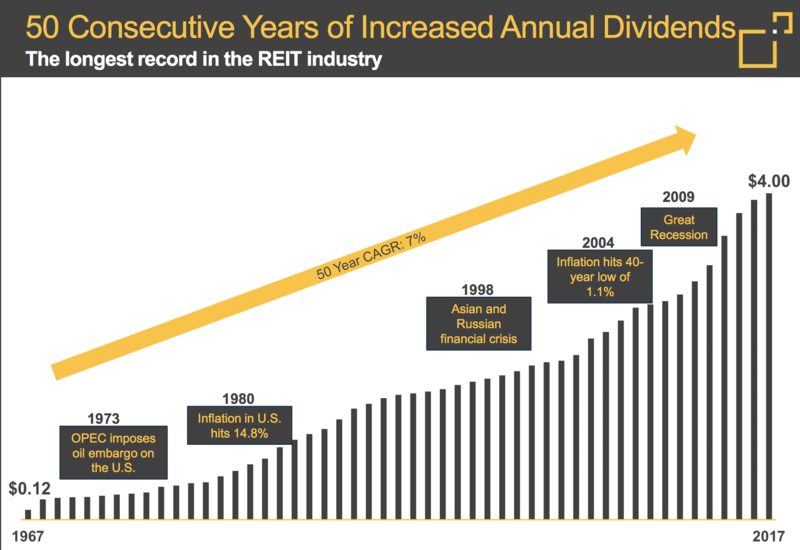 More impressively, Federal Realty also happens to have the single best dividend growth track record of any REIT in the world, with a remarkable 50 straight years of annual dividend increases. Going forward, the company has two main strategies for growth. First, it plans to opportunistically acquire new shopping centers that fit into its high-density and high-affluence model. More importantly, however, Federal Realty plans to achieve most of its long-term growth through aggressive but disciplined redevelopment projects. That means building hotels, offices, and apartments connected to or very near its existing properties. In fact, today Federal Realty owns over 2,000 apartment units which have a strong occupancy rate near 95% and steadily rising rents (due to the tight housing markets in their locations). There are three reasons why Federal Realty is focusing so much on non-retail developments. First, by turning its existing centers into mixed use properties, Federal Realty's retail locations become even more valuable to tenants. This is because offices, hotels, and apartments attract additional traffic to its shopping centers, increasing the value of its locations to retailers and supporting higher rents on its new leases. Second, the cash yield on investment is actually much higher than its core shopping center portfolio. For example, historically Federal Realty has achieved close to 6% cash yields on acquiring or building new shopping centers. However, the company has been getting 7% to 8% cash yields on its non-retail developments, which combined with its low cost of capital means that each new investment is even more profitable and accretive to cash flow per share. Finally, by targeting non-retail investment opportunities, Federal Realty has a far longer growth runway. In fact, management estimates that its mixed-use pipeline has more than $3.5 billion of development potential over the next 15 years. The final competitive advantage for this REIT is it's ample access to low cost capital to actually execute on its growth plans with less funding risk. Compared to many of its peers, Federal Realty maintains a relatively lower payout ratio, which results in higher amounts of retained cash flow that can be reinvested. However, like any REIT, Federal Realty still needs to turn to debt and equity markets to raise growth capital. The company's strong balance sheet gives it an A- credit rating from S&P, helping it to borrow at attractive interest rates. Management is also very skilled at recycling (i.e. selling opportunistically) the bottom 10% of its properties at very profitable prices. The proceeds can be used to fund growth projects at higher cap rates. Federal Realty also enjoys the industry's lowest cost of equity thanks to the well-deserved premium its shares typically trade for. In other words, the company can sell new shares to investors at a high enough price to ensure that its cash flow per share rises with each new investment. Thanks to its low cost of capital and set of retail and mixed-use growth opportunities, management expects Federal Realty's FFO per share to grow around 5% to 7% annually over the long-term, which is a good proxy for the company's future payout growth as well. All told, Federal Realty's combination of premium locations, investments into non-retail properties that enhance its store property values (and pricing power), low cost of capital, and lengthy dividend growth track record mean that this REIT appears to have strong competitive advantages to help it continue growing in the years ahead. However, despite Federal Realty's impressive track record of adapting to rapidly evolving and challenging industry conditions, there are still certain risks that investors need to be aware of. 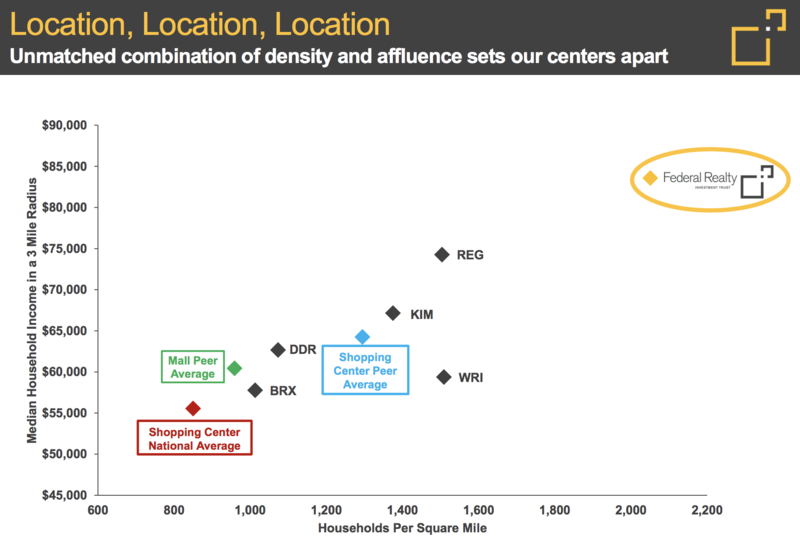 While Federal Realty's tenant base is highly diversified (no tenant represents more than 3% of total rent), it still does business with numerous struggling retailers such as The Gap (GPS), Ascena Retail Group (ASNA), and Splunk, which collectively account for close to 5% of total rent. While Federal Realty's locations are in highly affluent and high-traffic areas, the brands of these retailers have begun to fall out of fashion with consumers' fickle tastes. In other words, for some of Federal Realty's tenants, the issue isn't "location, location, location" but rather "you are selling the wrong products." Those stores may end up struggling and either the tenants won't be able to afford to remain in their current locations or the head office may end up shutting them down if sales disappoint badly enough. In some of those cases, the company could also have to invest more time and money into redeveloping certain locations before it can find a replacement tenant. The good news is that Federal Realty's prime locations have proven to be highly in demand as seen by its continuing strong lease spreads. Even if some of its tenants fail, the REIT should be able to eventually replace empty locations with stronger and thriving retailers, and likely at much higher rents. However, this turbulence may still result in short-term declines in cash flow growth that could disrupt management's long-term mid-single-digit growth target. Another risk to keep in mind stems from management's long-term focus on non retail redevelopment projects. While these are generally more profitable (higher cash yields on invested capital) properties than its bread and butter shopping centers, they can serve as a double-edged sword for two reasons. First, office, hotel, and apartment development is very different than shopping centers, requiring highly specialized expertise that Federal Realty has not yet proven it has to the same extent as retail. This is why Federal Realty has partnered with numerous local office, hotel, and apartment developers via joint ventures to help not only develop its non-retail properties, but also help to fund them. However, this brings up a second risk to Federal Realty's long-term growth prospects. Specifically, the REIT isn't large enough to have the kind of liquidity to fully go it alone on its $4 billion potential development pipeline. In other words, in the future it's possible that some of the REIT's development partners might end up running into financial difficulties. This might end up in costly project delays or cancellations. In addition, because real estate development is a highly complex endeavor, there is always the risk that Federal Realty won't be able to finish its projects on time or on budget. As a result, its cash yields on investment might fall short of projections, which could result in growth coming in below expectations and negatively affect the dividend growth rate. However, it should be noted that as Federal Realty grows and management gains experience in non-retail development and achieves larger scale, these risks should decrease overtime. Finally, many REIT investors are nervous about investing in REITs in a time when interest rates are rising and expected to continue to do so. After all, REITs can be highly rate sensitive, with their yields moving in near lockstep with 10-year Treasury yields at times. Since dividend yields rise when a stock prices fall, REIT shares could drop If long-term rates spike higher quickly. However, there are two important things to be aware of. First, REIT sensitivity to interest rates is cyclical (changes over time) and mean reverting. For example, since 1972 the correlation between 10-year Treasury yields and REIT total returns (as a sector) have essentially been zero, according to data from NAREIT and the St. Louis Federal Reserve. Hard assets, such as rental properties, can be a good hedge against inflation (when interest rates are usually rising). This is because inflation generally rises during times when the economy is strong, and a REIT can pass on rising costs to thriving tenants in the form of higher rents (via annual escalators or as its leases come up for renewal). The second important factor to keep in mind is that a well-managed REIT, which Federal Realty definitely is, will match its long-term borrowing costs to its lease duration. In fact, Federal Realty has been refinancing its debt to not only lower its interest rate, but also has achieve the longest average bond duration in its industry (over 11 years). As a result, when Federal Realty invests in new properties, either through opportunistic acquisitions or redevelopment, its profit potential should be fairly insensitive to interest rate movements over at least the medium-term. If interest rates are substantially higher when the company's bonds mature, then Federal Realty can probably sign higher rent leases to increase the cash yield on its properties and thus ensure its profitability remains highly stable. In other words, while rising interest rates could cause FRT's stock price to swing around over the short-term, they seem unlikely to threaten the REIT's long-term growth prospects or dividend security. The retail industry is indeed undergoing disruption right now, thanks largely to e-commerce and fickle consumer tastes and shopping habits. However, as with all industries, there are high-quality companies that have proven to be very adaptable over time. These businesses tend to be leaders in their industries and have time-tested management teams, strong balance sheets, unique competitive advantages, and numerous opportunities for long-term growth. 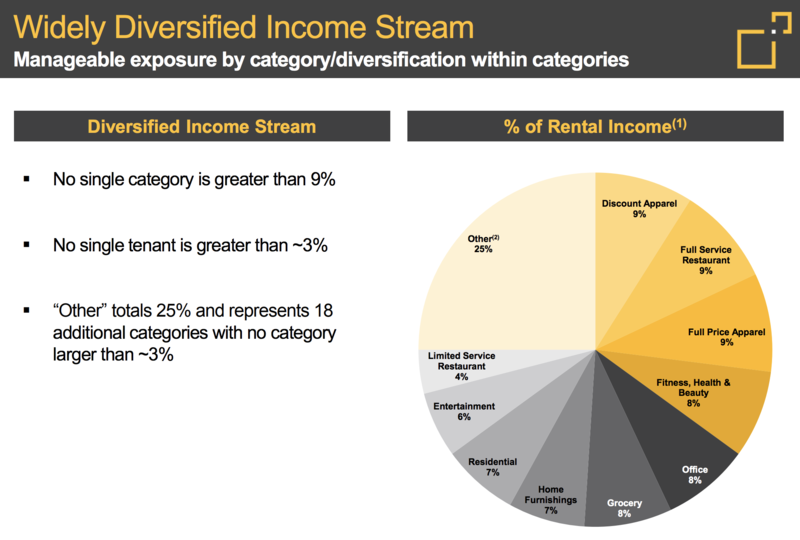 As the only dividend king in the real estate sector, Federal Realty has proven to have all of these qualities in spades. Conservative dividend growth investors interested in a shopping center REIT that appears to be very durable and capable of paying higher dividends for the foreseeable future should give Federal Realty a closer look.